Bob is ASE Certified and Master Certified in School Bus repair. 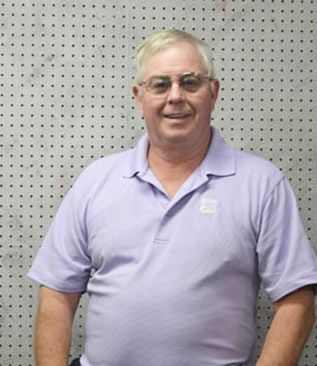 Bob has been with the company since 1965. His wife Marian is also in the business. Bob has 4 children which 2 are involved with the business. Marian has been a part of the company since 1989. Marian is part of the office staff and will help set up appointments and help with any questions customers may have. She is also full time organist for St. John the Baptist Church and Precious Blood Church. Marian is the wife of Bob Heitbrink and enjoys her 4 children and her beautiful grandchildren. Ted has been a part of the company since 1991. Ted is ASE Certified. Ted works with all the diagnostic and electrical problems on vehicles. Ted is a graduate of Marion Local High School and also UNOH of Lima, Oh. Ted and his wife Stacey live in St. Henry OH with their 3 children. Ted also coaches fall and winter soccer and helps coach summer Little League baseball. Ted is involved with the St. Henry Cub Scouts as a Scout Leader. Andy has been a part of the company since 1991. Andy is ASE Certified and works on all Under Body and mechanical problems your car may have. Andy continues his education each month at regular training classes offered to him. He and his wife live in Maria Stein Oh with their 3 children. Andy is a Volunteer Fireman with the Chickasaw Volunteer Fire Department. Renee has been with the company since 1998. She answers phones and makes appointment and stays is close contact with the customers in regard to their vehicles. Renee routes the work of the techs and order parts. She sees each vehicle from start to finish and makes sure the job is done right. Renee lives with her husband and 2 children in St. Sebastian, OH She loves camping and coaching Freshman Volleyball. Joe joined the family business in 2011. Joe continues his education each month with mechanical classes. He works on under-body, school bus, and does Rust Proofing. Joe lives with his wife in St. Henry, OH. Joe is a volunteer with the Mercer County Cancer Association. He loves camping and the great outdoors.